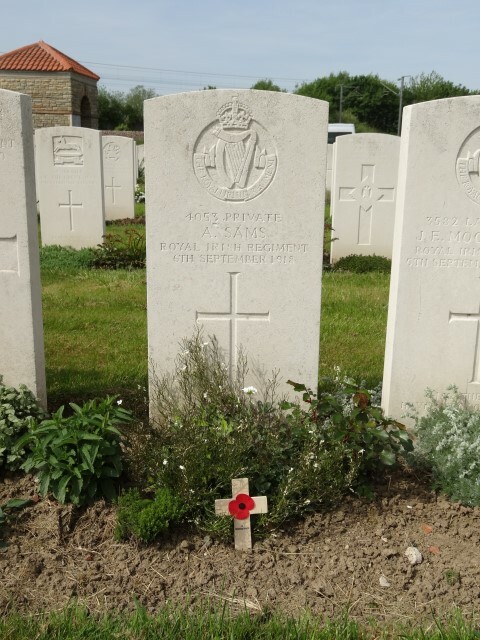 4053 Private Arthur Sams, 8th Battalion, the Royal Irish Regiment was killed in action 6 September 1918 and is buried at La Grand Beaumart British Cemetery, Steenwerck, France. He was 22 years old and is commemorated on the Etherley War Memorial and the Roll of Honour in St. Cuthbert’s Church, Etherley. Arthur Sams enlisted at Bishop Auckland into the Durham Light Infantry and was allocated the regimental number 3678. He was transferred to the North Lancashire Regiment (No.36530) then the Royal Irish Regiment and given the regimental number 4053. His service details have not been traced therefore the date he enlisted and of his transfers remain unknown. The 8th Battalion, the Royal Irish Rangers was a New Army (Service) battalion formerly the 2nd Garrison Guard Battalion which became the 8th Garrison Battalion 25 May 1918. The battalion landed in France in April 1918 and came under the orders of the 178th Brigade, 59th (2nd North Midland) Division before being transferred to the 121st Brigade, 40th Division 20 June 1918. After suffering heavy losses during the Battles of the Lys, the Division was reduced down to a cadre from May 1918. Form 23 June, the Divisional HQ was based at Renescure. The training cadres left during the middle of the month and a number of Garrison Battalions joined and were converted to fighting units. The Division was reorganised by mid-July 1918. The 40th Division as part of the XV Corps, Second Army took part in the engagement. The War Diary of the 8th Battalion, the Royal Irish Regiment has not been researched. Later research records that between 18 August and 6 September 1918, the 8th Battalion, the Royal Irish Regiment lost 23 Other Ranks killed in action or died of wounds 11 Other Ranks 5 September including Private A. Sams and 11 Other Ranks 6 September.